During Baking Wizards introductory special you will receive not one Premium Quality Non-Stick Silicone Baking Mat, but TWO! Their mats are a perfect fit for half sized baking (18 by 13 inch) trays. All materials used in their mats are FDA & LFGB Approved. These Non-Stick mats will save you time and money as they are super easy to clean and can be used thousands of times. These Oven, Microwave and Freezer Friendly mats can be used for Baking, Roasting, Warming as well as for preparing dough. No more cutting parchment paper or greasing the baking tray or buying special oils and sprays. Their mats are HASSLE FREE, just simply place the mat onto your tray and let the magic begin! Rest assured you’ll have NO REGRETS with purchasing their mats because they offer a LIFETIME GUARANTEE! Baking Wizards has graciously offered to give two lucky winners a 2 pack set of their professional grade silicone baking mats! For your chance to win just enter on the widget below. Remember the more entries you do the better your chances are of winning. 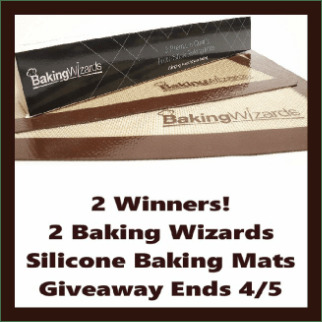 Prize: Baking Wizards has offered two lucky winners a 2 pack set of their professional grade silicone baking mats. Disclaimer: PaulaMS’ Giveaways, Reviews, and Freebies nor any blog hosting this giveaway is not responsible for the awarding of the prize. Sponsor is responsible for prize fulfillment. Disclosure of Material Connection: I received the product mentioned above to facilitate the writing of this review. Some of the links in this post are affiliate links. This means if you click on the link and purchase the item, I may receive an affiliate commission. Which will be used to run this blog. Regardless, I only recommend products or services I use personally and believe will add value to my readers. I am disclosing this in accordance with the Federal Trade Commission’s 16 CFR, Part 255: Guides Concerning the Use of Endorsements and Testimonials in Advertising. Happy Easter! My family had a wonderful day. It was a sunny day, and we were able to play outside until it got dark. Perfection. We do a lot of baking at our house. I have been interested in these silicone mats for some time. They look really nice, and would make clean up a breeze.